The Vermont Farmhouse, 2014, is a very large house. I didn't do much kitbashing on this house. 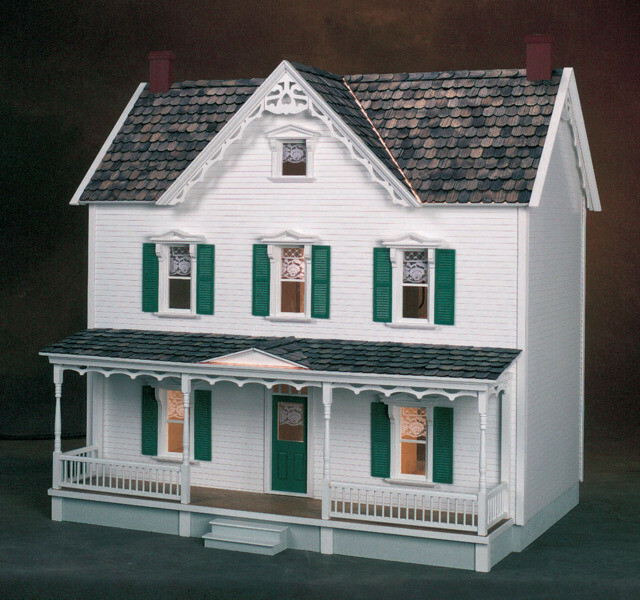 This house was built from the inside out with the exterior shell assembled first, but the interior was completely finished before any finishing took place on the exterior. The first order of business is to select a color scheme. Through research, I found most farmhouses are white, but yellow is my favorite color, so I selected a palate that would work with yellow. I found the hound on the porch at an antique store. My dad made the mailbox. 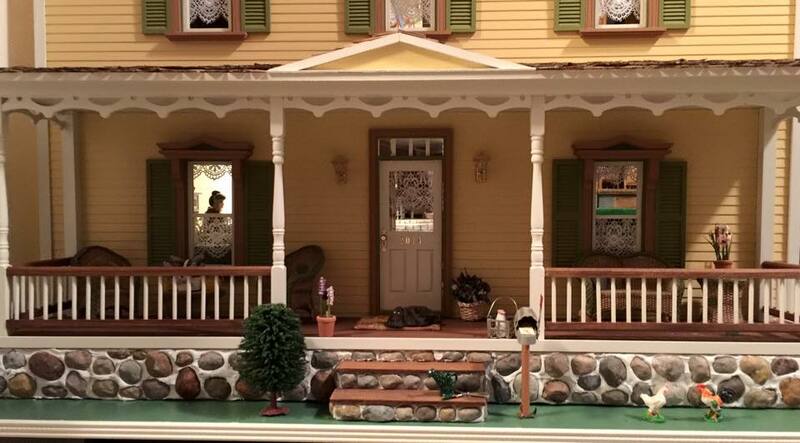 Since the kitchen is my favorite room (in miniature only) I started with it, and let the rest of the house evolve. 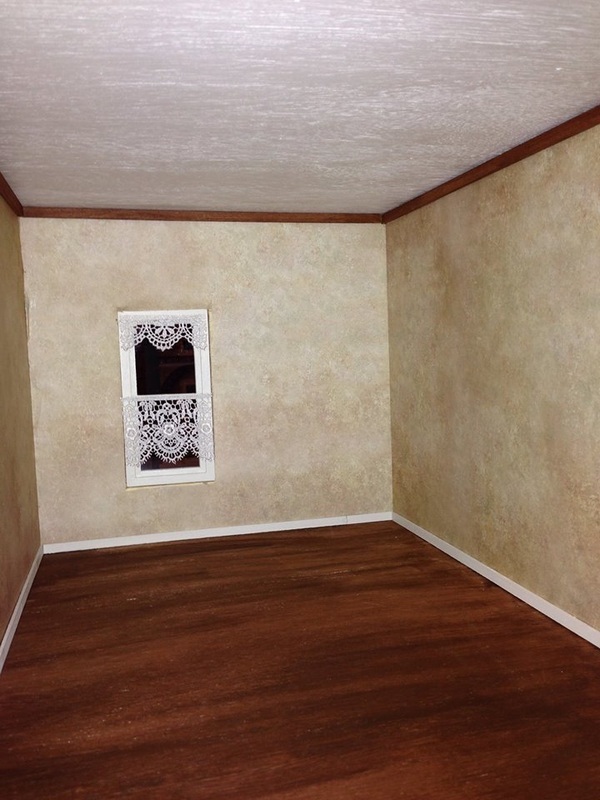 The ceiling in this room is covered with real sized stucco wallpaper. 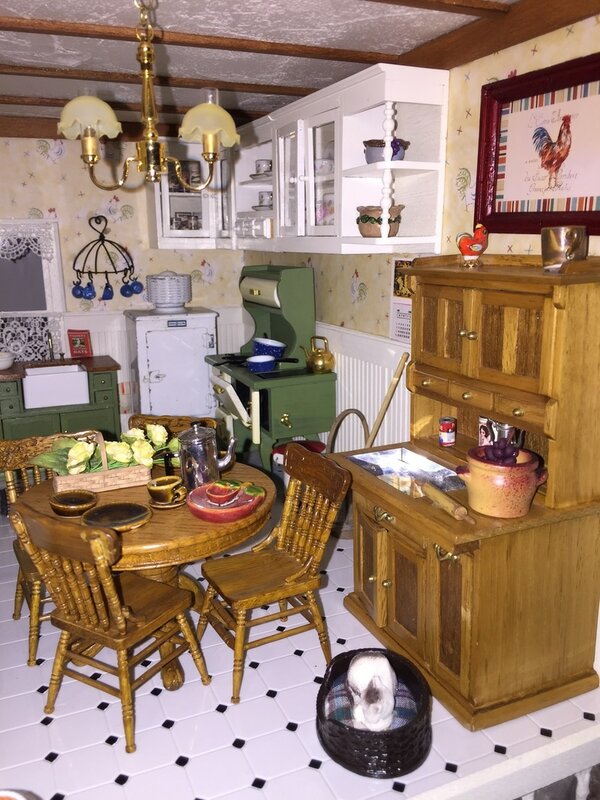 The kitchen furniture was painted green and the wallpaper is actually scrapbook paper. The kitchen table and chairs are by Reminiscence, my favorite brand made in the 1970s for a very brief period. Ceiling beams, wainscoting, cabinets, and lace curtains add to the atmosphere. There's a old beat-up icebox in the back corner that I purchased on eBay.I decided to leave it in its damaged condition as it added so much character to the room. 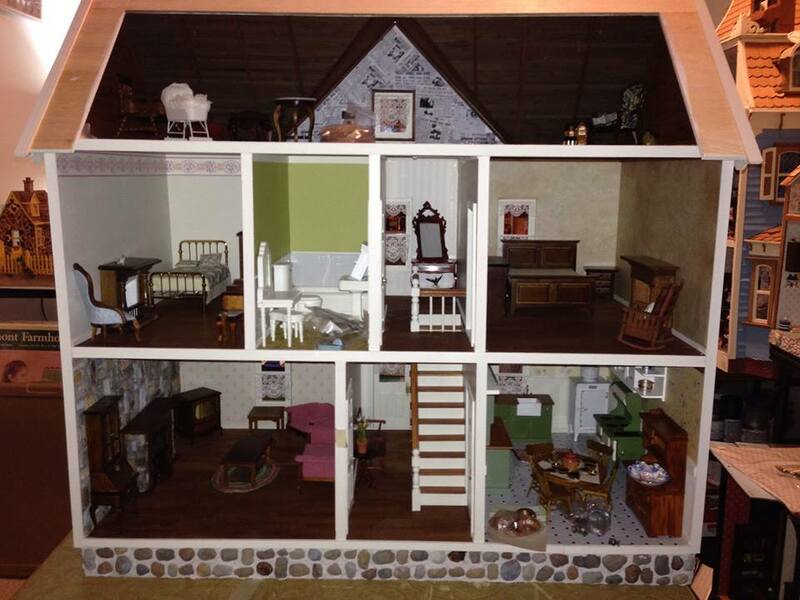 A shelf runs the length of the left wall and holds a collection of kitchen items and Sculpty cookie jars. The final picture of the kitchen contains a newly obtained Reminiscence kitchen cupboard which matches the table set. 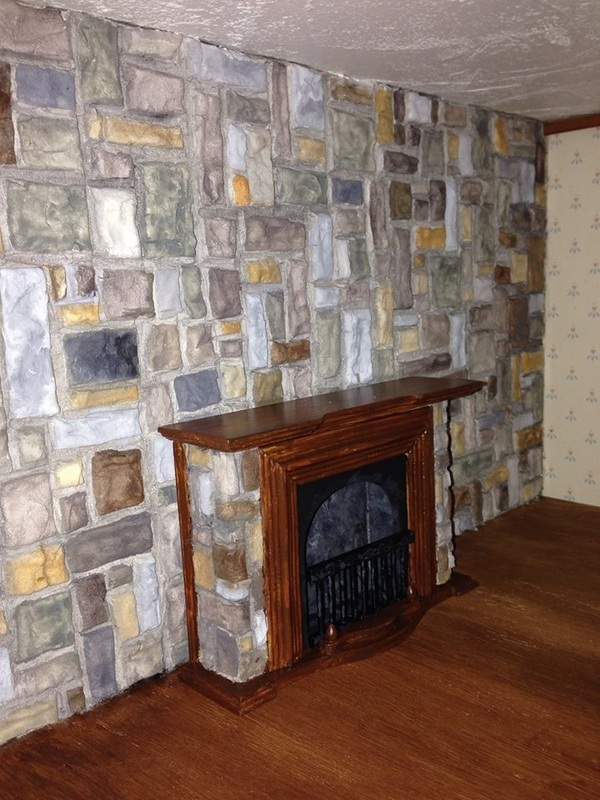 I purchased in inexpensive fireplace and used Paperclay to add stonework to both it and the wall. 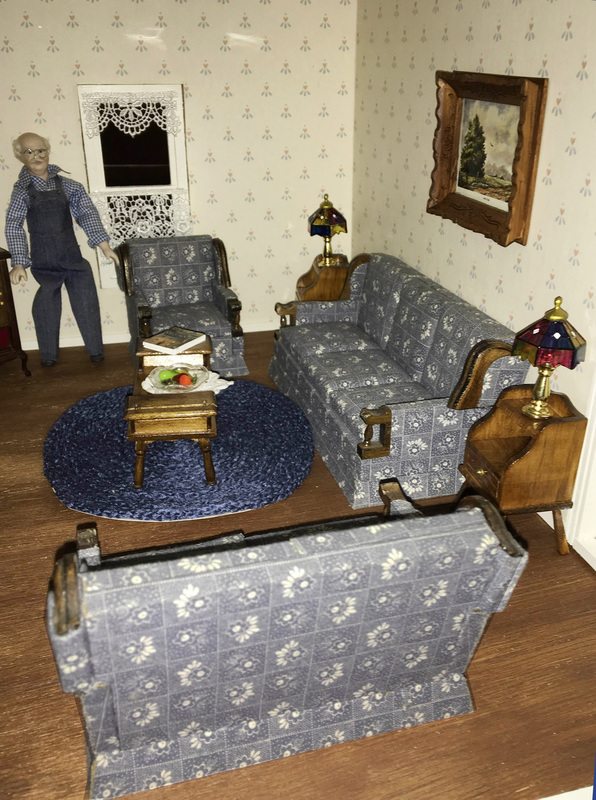 It took a while before I found furniture that fit the parlor, but I really liked the way these Concord pieces fit into the country decor. 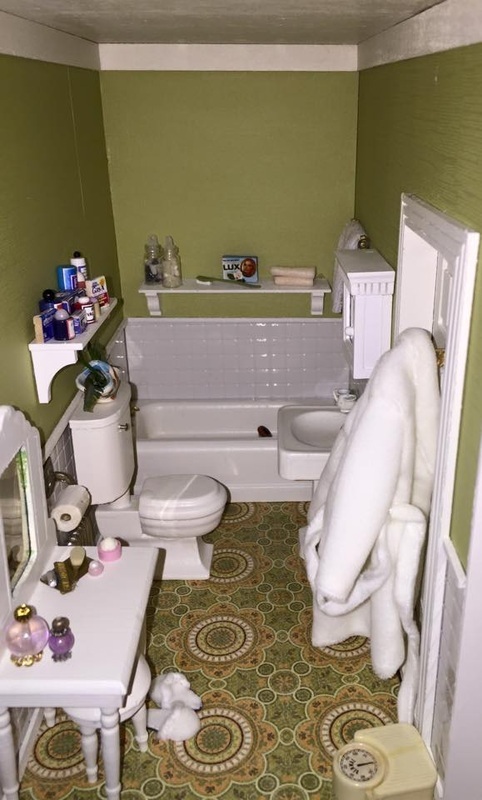 My second favorite room in a dollhouse is the bathroom. 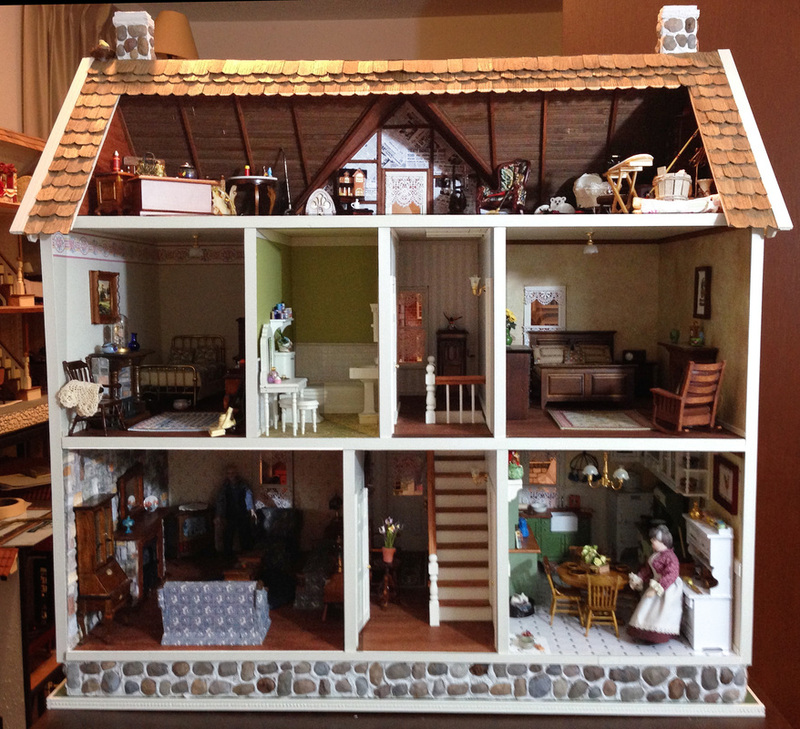 I love this 1931 wooden Strombecker set I found online. 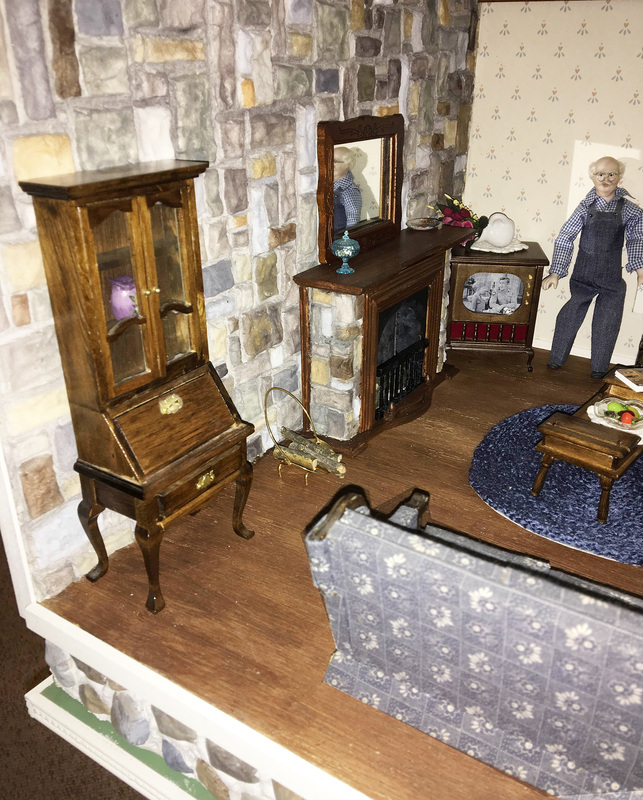 I repainted the set and made sure the room was large enough to hold all pieces. The walls gave me a fit! At first I put the white tile on the top half of the walls, but had to remove everything and do the walls over with the tile on the bottom. 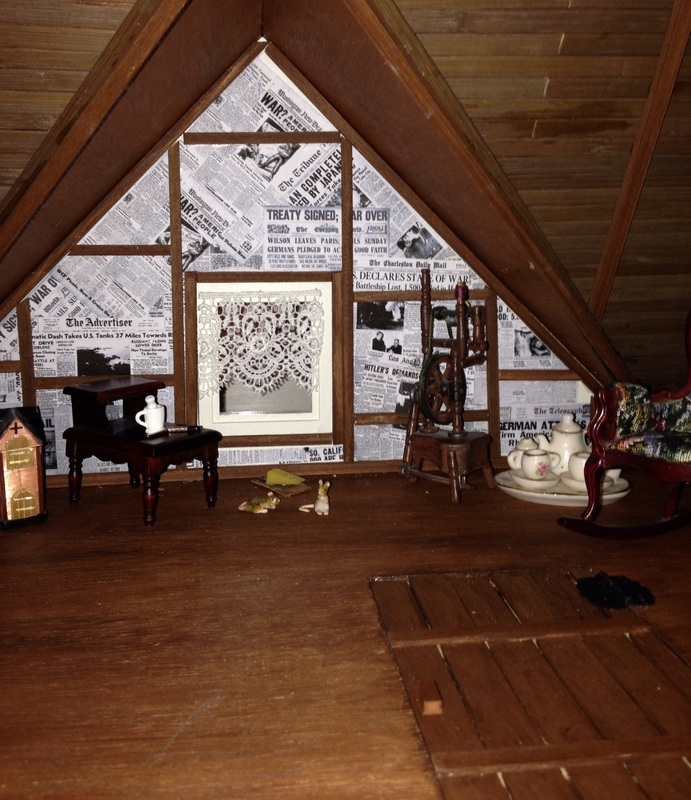 The green walls and the flooring are scrapbook papers. 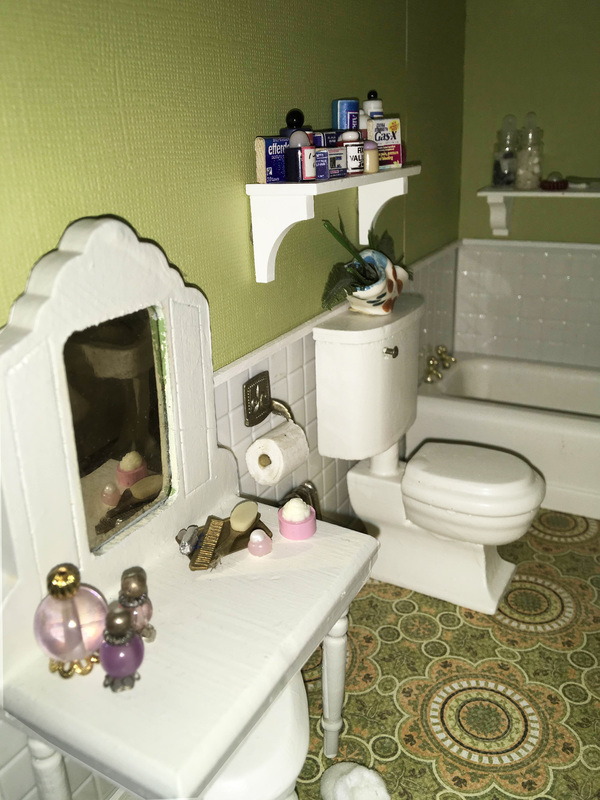 This second picture shows the same bathroom with accessories. The bathroom scale is a Renwal piece. 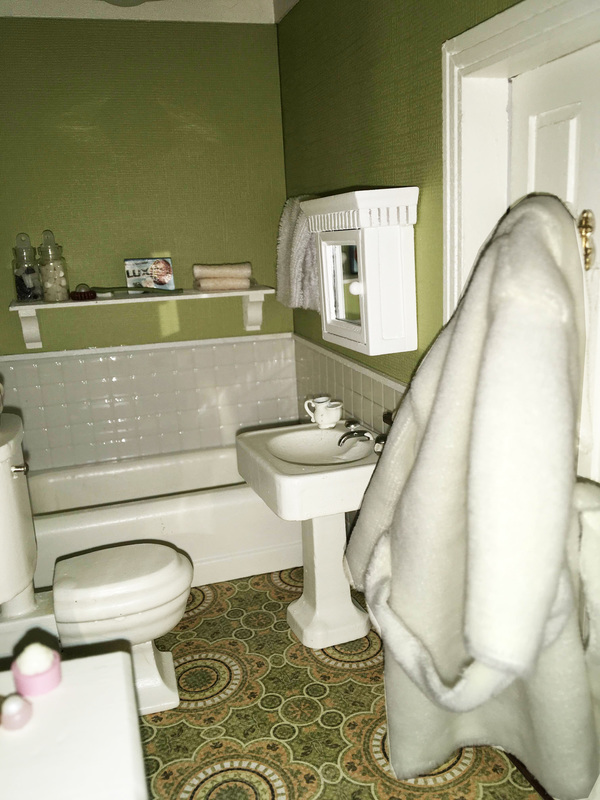 Later I added an additional shelf, robe and slippers. 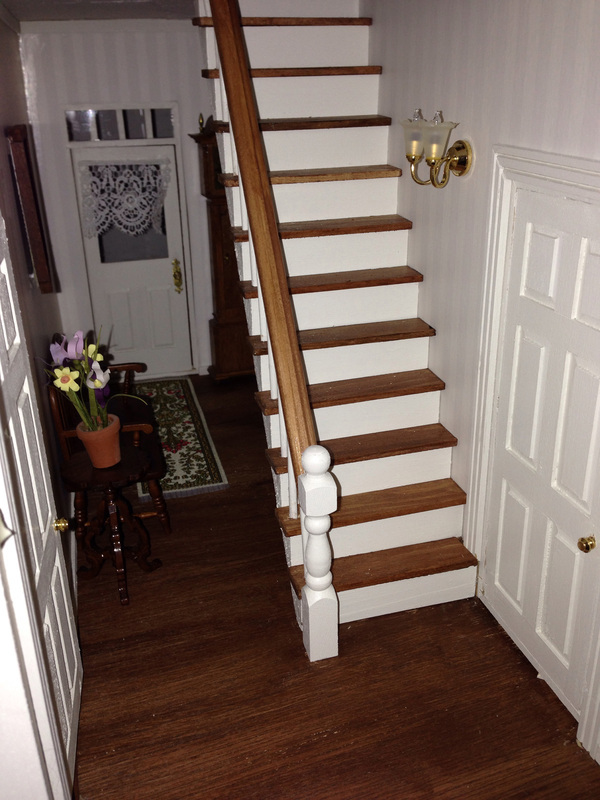 The one thing I dread when building a house is the staircase. 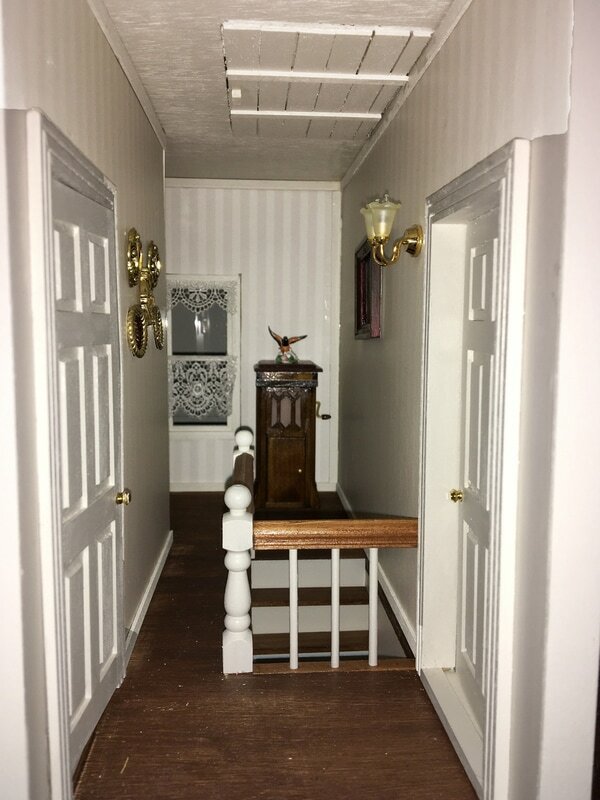 This house was supposed to have two, one leading to the second floor and one leading to the third floor. 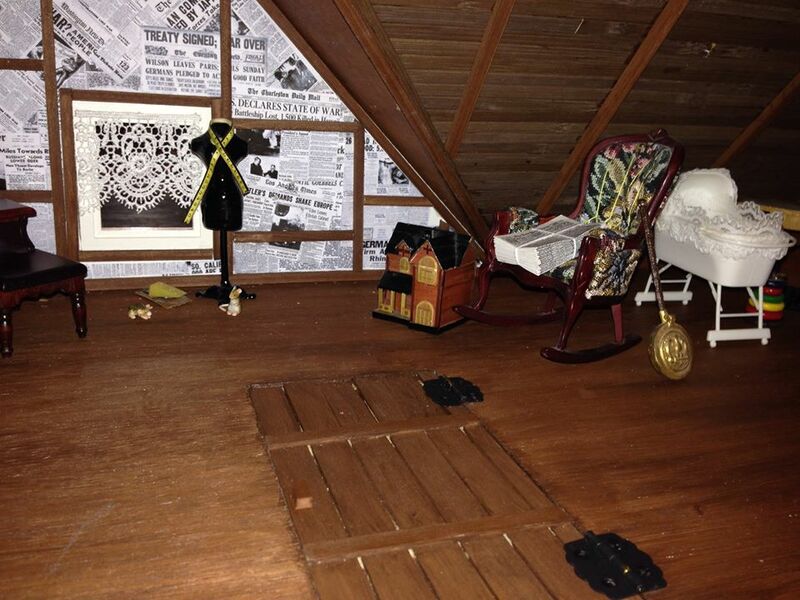 I decided to make the third floor into an attic, so the second floor staircase was omitted. This also allowed me to skip making the staircase, a big plus! 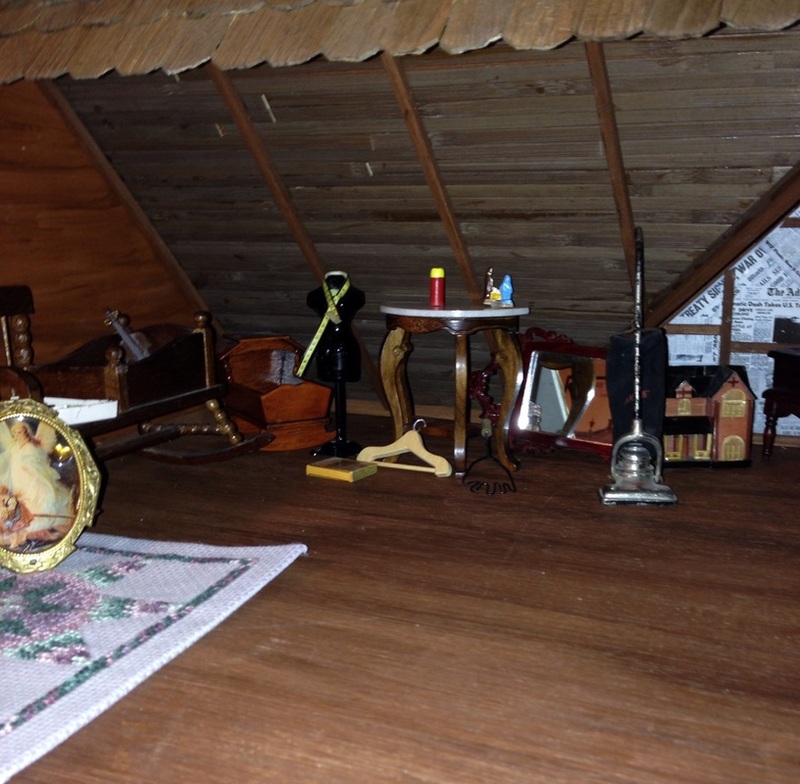 The second floor landing and the attic door in the ceiling. 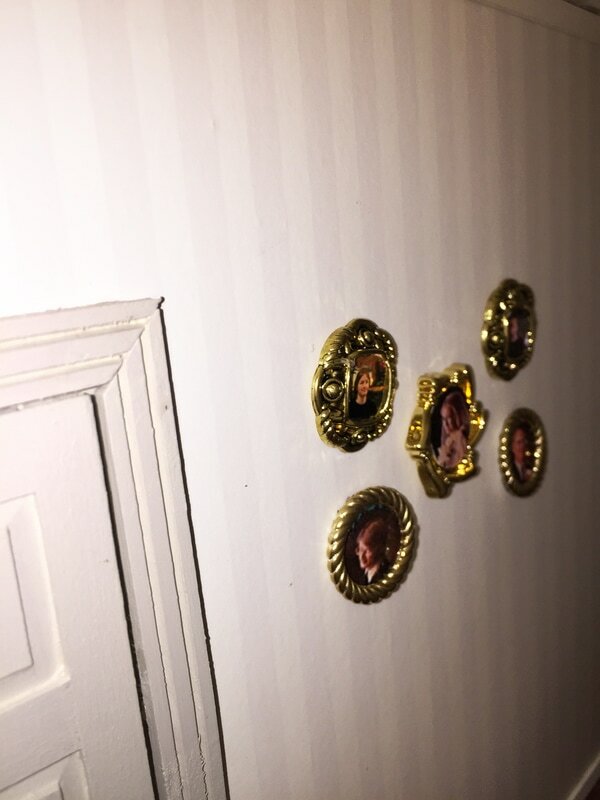 Family picture adorn the left side of the hall. 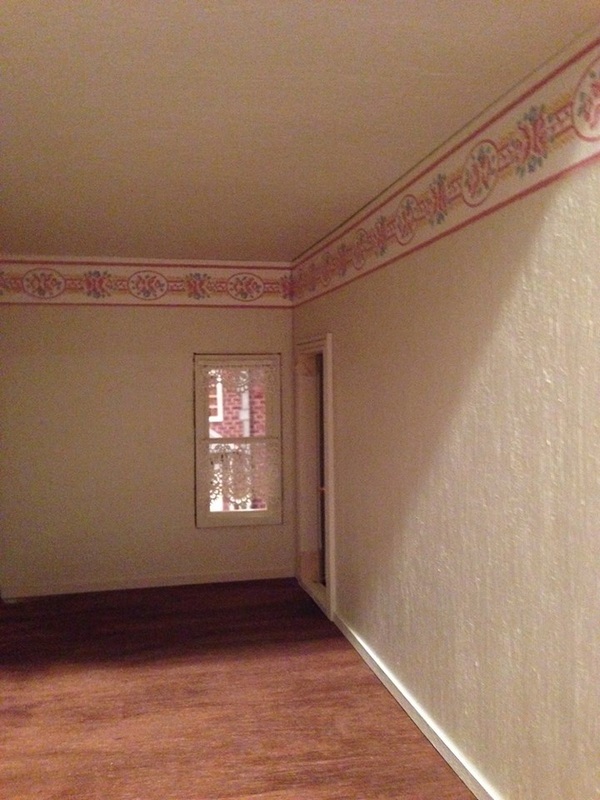 This second floor guest bedroom is very small. 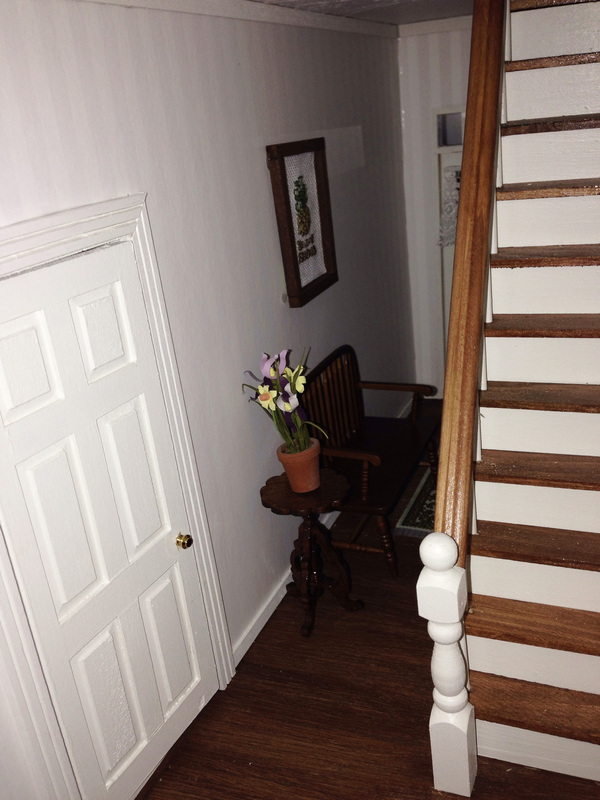 The door at the back of the room leads into the hallway behind the bathroom. The room contains a single brass bed, a Valentines Day gift from my sweetie. 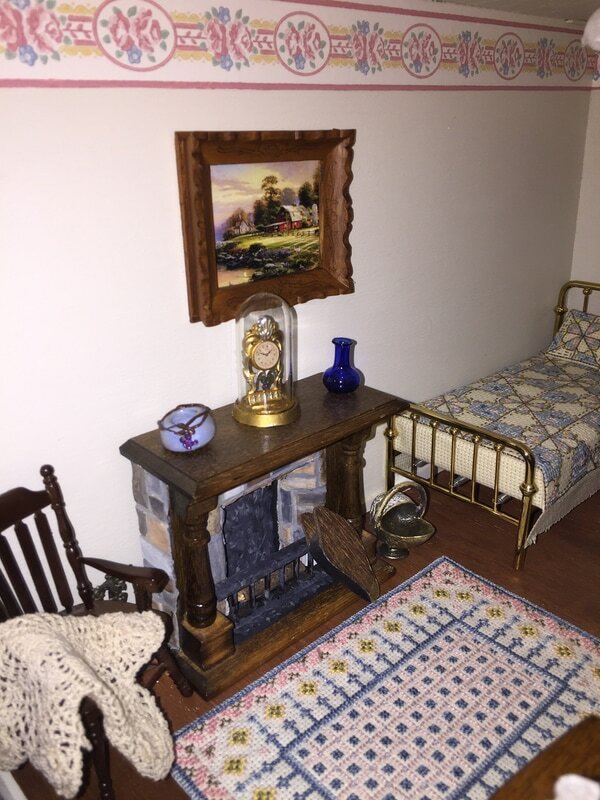 A pastel colored cross-stitched quilt, pillows and rug were made for the room, so the border, which is actually made from real wallpaper border, was selected to match. Most real-sized wallpaper borders contain a design at the top and bottom. These can be cut out and make perfect dollhouse borders. The walls were just painted white. The master bedroom wallpaper was selected to match an earth toned cross-stitched quilt that had already been made for the house. This room will also contain a fireplace. 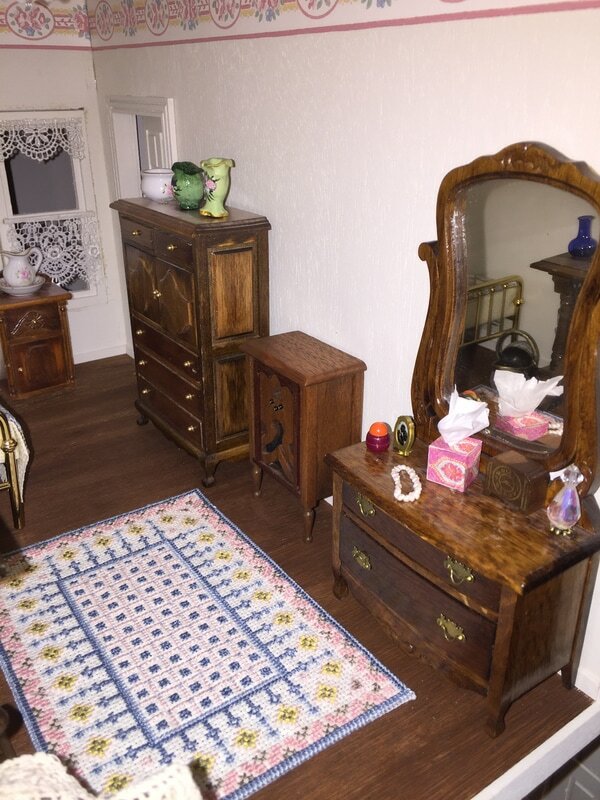 I plan to replace the small rug with a larger one that fits the color scheme better. The rocker is by Raine, Take A Seat. The master bedroom is still sparsely furnished at this point. 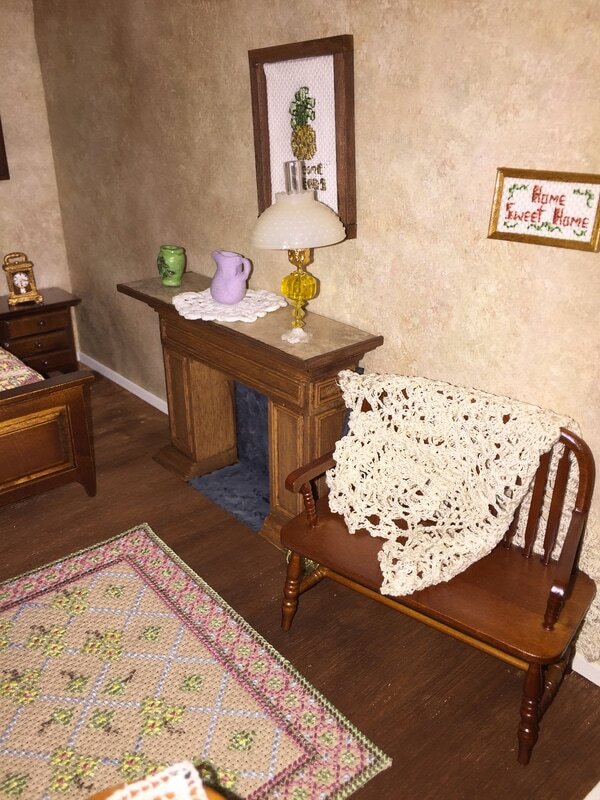 A cross-stitched rug and wall hanging has been added to the master bedroom. Foundation and porch installed. 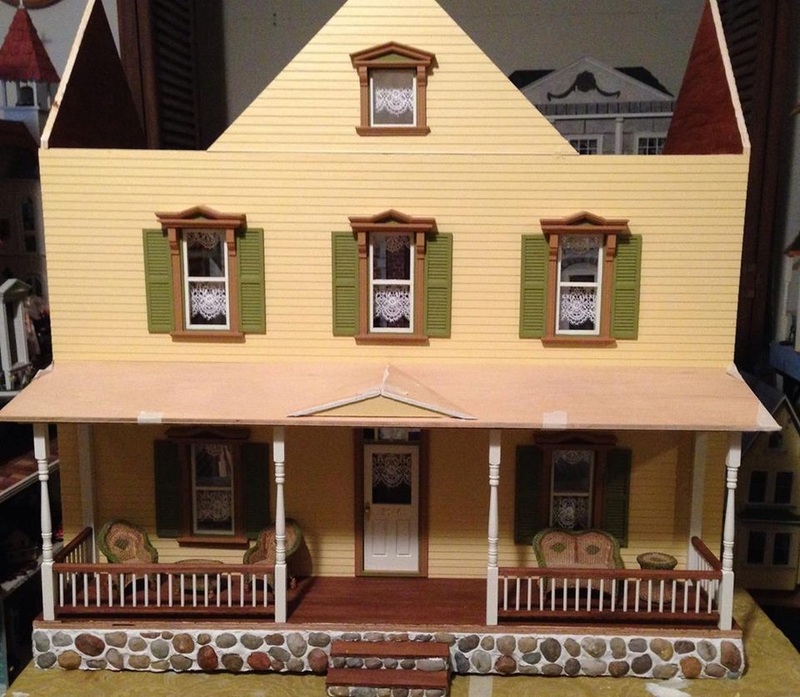 The wicker furniture is actually resin pieces that I painted to match the house. The roof was installed after the interior was completed. 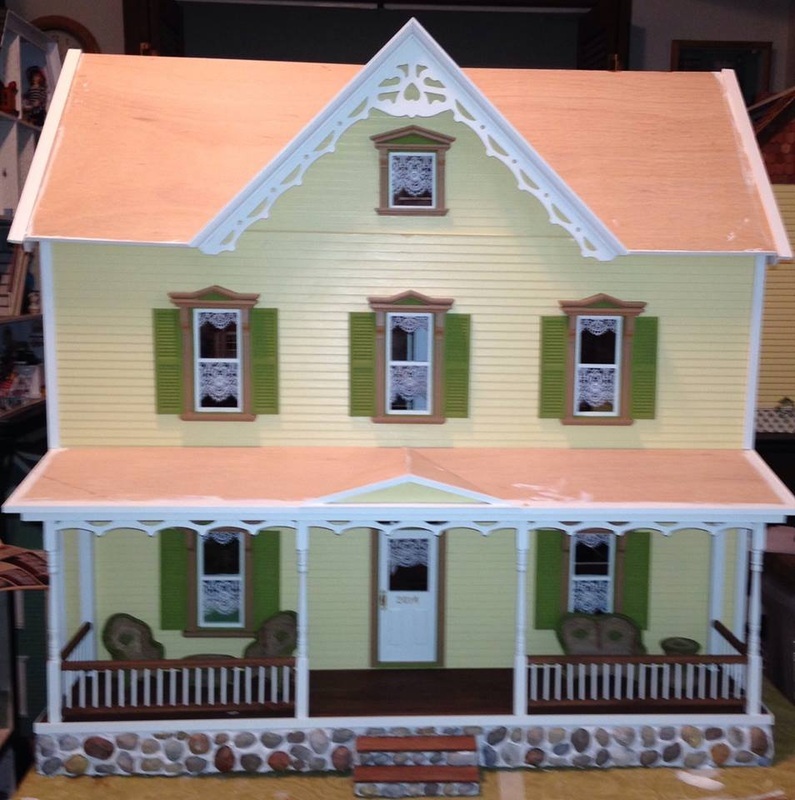 The porch furniture is resin and painted to match the house. 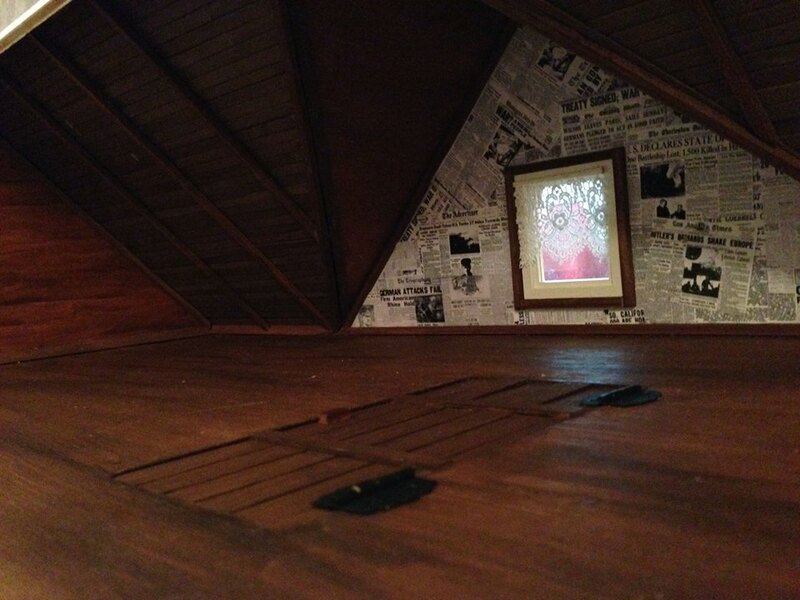 Attic almost finished. 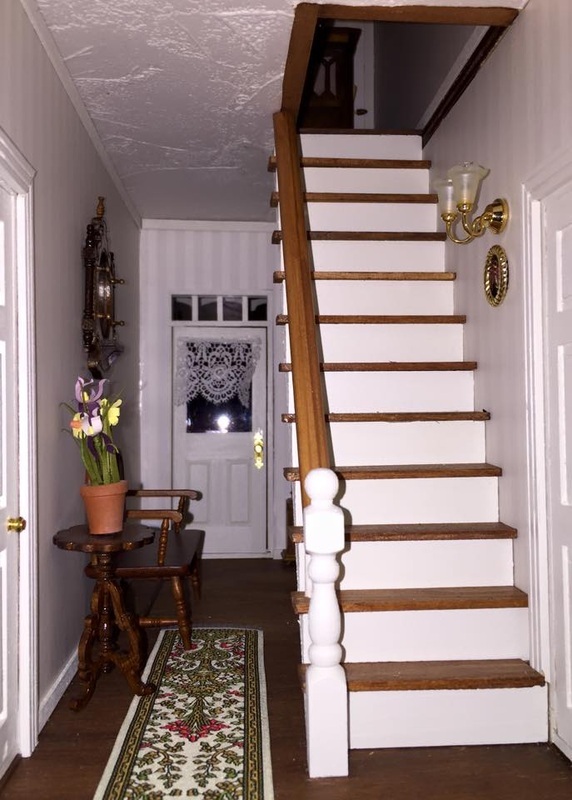 Note door in flooring. 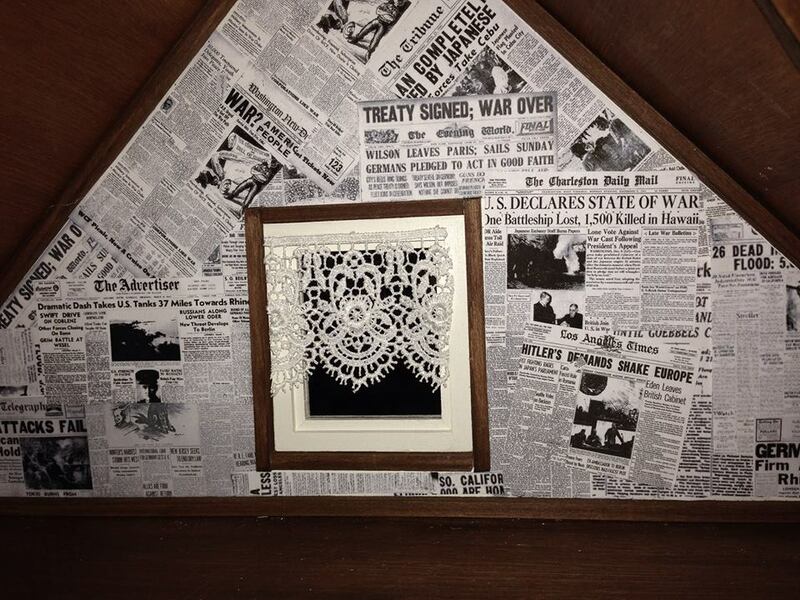 WWII Newspapers used to line the wall. This wall has gone through several revisions. 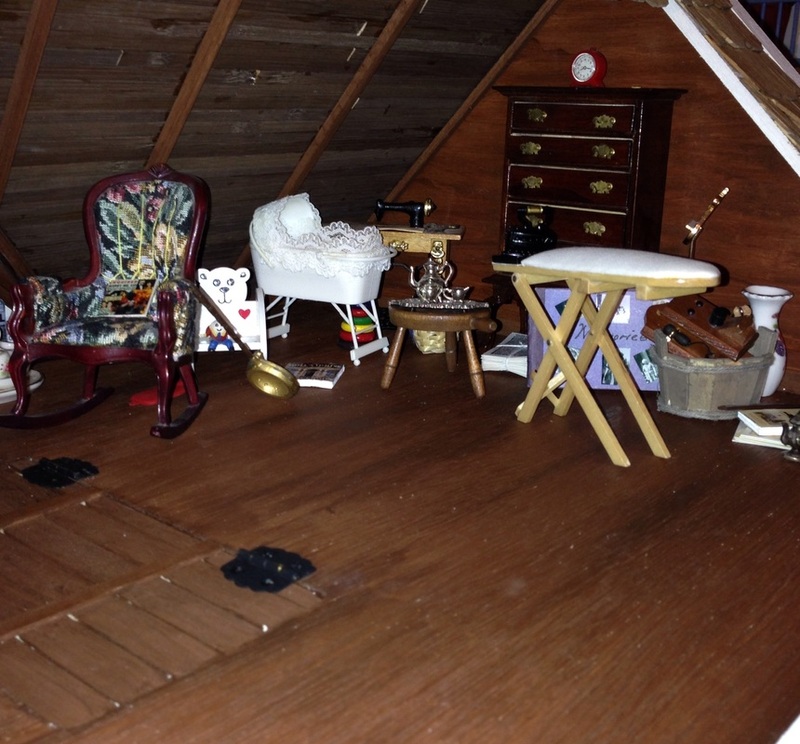 Can you find the attic mice? 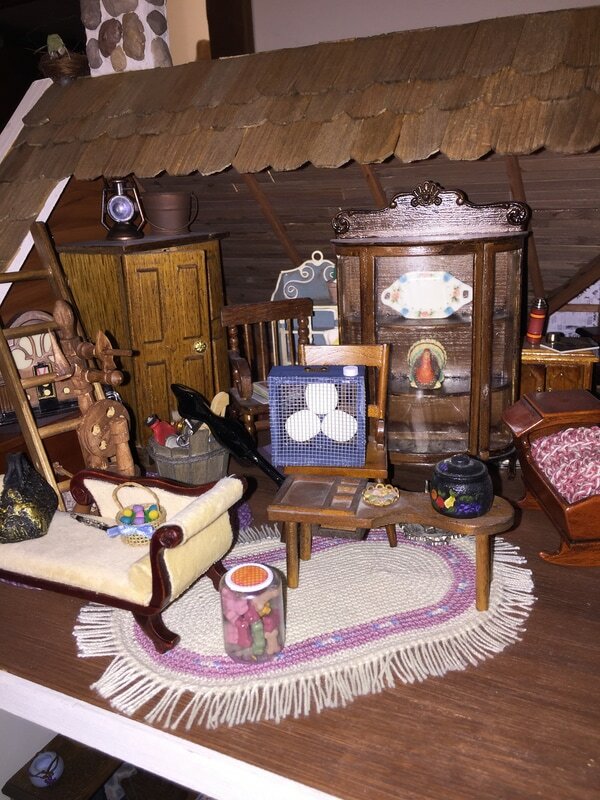 The spool piece near the window is actually a pencil sharpener. The rocker is by Concord. 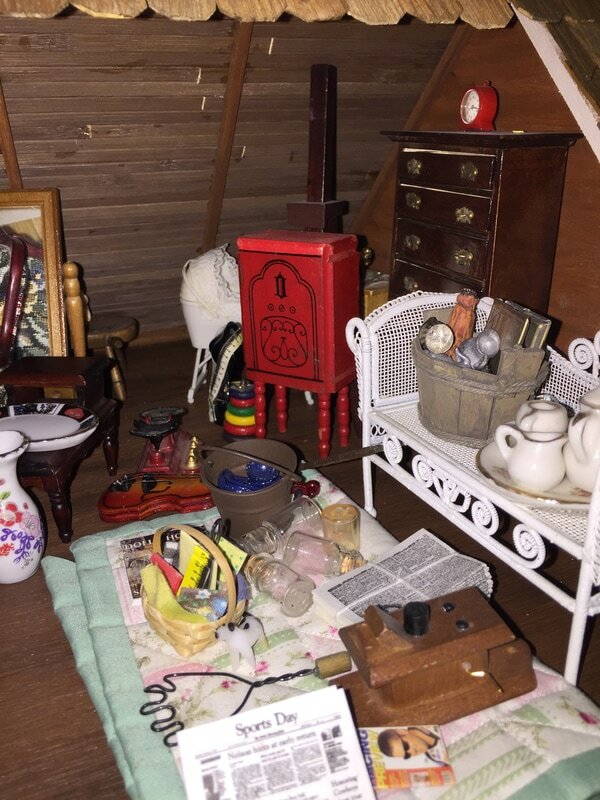 The red alarm clock is by Renwal Looks like the attic is filling up!